Many people in the seven European Union nations surveyed express negative views about minority groups in their country. In particular, negative attitudes toward Roma (sometimes also known as Gypsies) are common, while many also give Muslims unfavorable ratings. Negative attitudes toward Jews are less pervasive, although substantial minorities express an unfavorable opinion about Jews as well, especially in Greece where nearly half the public hold this view. Negative sentiments about all three groups are consistently more common among people on the ideological right. In Italy and France – countries where policies toward Roma communities have generated tremendous controversy in recent years – large majorities have unfavorable opinions of the Roma who live in their country. Fully 85% of Italians and 66% of French express this view. In Greece, Britain and Poland, about half give Roma negative ratings, as do at least four-in-ten in Germany and Spain.In Germany, since 1991, unfavorable sentiment toward Roma has declined from 60% to 42%. In Spain, over the same period, it has fallen from 50% to 41%. There is a strong relationship between ideology and attitudes toward Roma. People who place themselves on the right side of the political spectrum tent to offer more negative opinions, although these views are not uncommon among those on the left. More than half of respondents (54%) on the ideological left in France say they have a negative view of Roma, but this opinion is even more pervasive on the right (76%). Similarly, 31% of left-of-center respondents in Germany give Roma an unfavorable rating, compared with 51% of those on the right. Double-digit gaps also exist in the UK, Greece and Italy. As is the case with attitudes toward Roma, views about Muslims are tied to ideology. 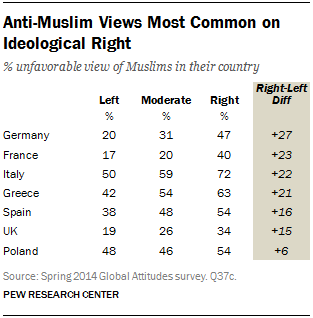 While 47% of Germans on the political right give Muslims an unfavorable rating, just 20% on the left do so. The gap between left and right is also more than 20 percentage points in France, Italy and Greece. And significant differences are found in Spain and the UK as well. Attitudes are also linked to age, with negative sentiments more pervasive among older respondents. In Spain, about half of those age 50 and older (51%) give Muslims in their country an unfavorable rating; only a third of people under age 30 say the same. Significant differences between people 50 and older and 18- to 29-year-olds are also found in France (a gap of 12 percentage points), Germany (13 points), Italy (12 points) and the UK (9 points). Compared with Roma and Muslims, Jews receive relatively higher ratings. Still, 47% of Greeks say they have an unfavorable opinion of Jews in their country, and notable minorities in Poland (26%), Italy (24%) and Spain (18%) say the same. In France, the UK and Germany, 10% or fewer hold a negative view. In Germany, since 1991, unfavorable views of Jews have fallen from 24% to 5%. And in Poland they have declined from 34% to 26%. In Poland, Italy and Greece – the three countries where unfavorable ratings are most common – anti-Jewish sentiments are more pervasive among those on the right of the political spectrum than on the left. Chapter 2. Crisis of Confidence in the EU Ending?